When Can My Child Start Using Regular Toothpaste & Does Children’s Toothpaste Work for Adults? When you bring a baby into the world there are so many different things to think about. What kind of diapers will you purchase? What type of car seat will you use? Will you nurse or bottle feed? What will you name your sweet baby? The questions can go on and on. One topic that we get lots of questions about here at Smile Reef is toothpaste. Parents want to know what kind of toothpaste they should use for their child. Our parents want to know if they should use kids’ toothpaste or adult toothpaste for their children. Is there really a difference between the two? Yes there is indeed a difference between childrens’ toothpaste and adult toothpaste. The biggest difference is that kids’ toothpaste has the appropriate amount of fluoride for children. Fluoride is important for our teeth to stay healthy but if they are exposed to too much fluoride they may develop fluorosis. 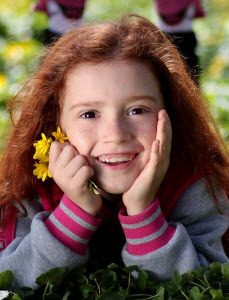 If your teeth have little white spots on them it is from fluorosis. One of the next questions that parents ask about brushing their children’s teeth is when they should start brushing their teeth. You should start cleaning their gums with a soft brushed toothbrush and water when they are young. You will not want to begin using toothpaste as soon as their adorable little teeth erupt from their gums. For kids 2 and under you will want to use a tiny smear of a low fluoride childrens’ toothpaste. Once they turn 2 you will want to increase the amount of toothpaste to a pea sized drop of toothpaste. 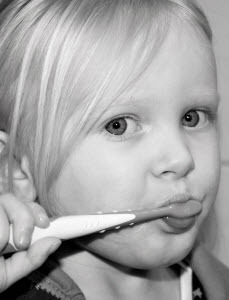 When Should a Child Brush Their Own Teeth? As you begin teaching your children how to brush their own teeth you will want to help them every day. Young children have a hard time getting all of their properly brushed without your gentle reminder. Teaching them how to brush all of their teeth as well as all the sides of their teeth is an important job for parents to fulfill. You will also want to teach them how to properly spit the leftover toothpaste out in the sink instead of swallowing it. Studies have shown that children are not truly capable of brushing their teeth on their own until they are 8 to 9 years old. When your child is about 6 years old you will want to talk to Dr. Jensen about moving them to adult toothpaste. Normally children at this age are ready for more fluoride in their toothpaste. At this time the added amount of fluoride in adult toothpaste will keep their teeth healthy and clean. Does Children’s Toothpaste Work for Adults? Sometimes we have adults that want to know if it is okay for them to use children’s toothpaste. The answer to this one is no. The amount of fluoride in children’s toothpaste is not sufficient for adults. If you prefer the flavors that are typically more common in children’s toothpaste you can actually find adult toothpaste with more flavor options if you do some research. The best thing that parents can do for their children’s dental hygiene is to brush their teeth regularly from a young age. You only get two sets of teeth (baby teeth and adult teeth) so you need to treat them well if you want them to last a lifetime. Brushing twice a day with the correct toothpaste and seeing your dentist twice a year will help your teeth stay healthy and strong. 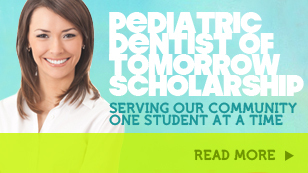 Smile Reef can handle all your pediatric care needs!